Part of doing great accountability is helping people avoid the dangers of isolation. When we’re isolated, we can’t really progress. Now, I’ll be the first to say that too much progress is not necessarily a good thing. But when we’re truly isolated, not only are we prone to flawed-character activity (i.e. sin) but we also can’t really learn anything new from others. Anything from technology to language. We cease to communicate, and we end up like the Sentinelese: I became fascinated by the Sentinelese culture and spent an entire evening reading everything there is on the internet. Which isn’t much. Because they’re very isolated. So that’s the point. North Sentinel Island in the Andaman Island chain contains the greatest example of an isolated culture left on the face of the earth. Numbering somewhere between 50 and 400, the inhabitants are locked in Stone Age life; it’s unclear whether they’re capable of using fire; their weapon of choice is a bow and arrow or spear, which they might be tipping with metal from shipwrecks. When intruders come for a visit the good Sentinelese people kill them. The Indian government, which recognizes them as essentially sovereign, understands their position to be one of self-defense. The last time they killed some poaching fishermen, the Indian government did nothing. As near as I can tell there has only been one exception to this rule of violence, when a group of anthropologists from India took gifts of coconut and came very close to shore. 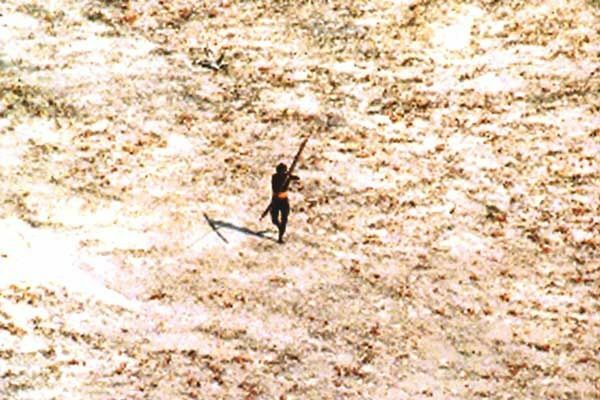 The Indian government’s official policy is that nobody is to allowed to contact the Sentinelese. For one thing, nobody can speak their language. You’re likely to be killed; in this image a Sentinel Islander dares a helicopter to land. The pilot decided against it. And you’re likely to kill them — by spreading infectious disease the Sentinelese are unable to combat. It is incredible to me that these people have had such little contact with the outside world — for 5,000 years, minimum, some scientists think they’ve been alone on North Sentinel for 60,000 years. I think it’s easy to idealize this primitive life. For one thing, these folks are so in tune with their natural surroundings, they appeared unharmed and unfazed when the tsunami destroyed so much in 2004. It is speculated that the Sentinelese were tipped off to the coming tsunami by something they alone would see in the waves that lap their shores. (The helicopter which took this picture was there to check and see if they were okay after the tsunami). So the language they speak with the waves and sky, the fish and trees, has a vocabulary for that. It’s also easy to idealize our technology-heavy culture. We have ships, and helicopters. We must seem to them as though aliens from another world had come to visit, perhaps to abduct them for horrible scientific procedures. Or perhaps we seem like demons. In any case, our technology doesn’t protect us from tsunamis. The most notable thing is not whether living the Stone-Age vida loca is some sort of paradise on earth without knowledge of kindling, or whether these folks would be better off reading my blog on their Kindles. The most notable thing is their fear. Whatever else isolation has given them or taken away, they are afraid. Always afraid. Afraid in every recorded encounter. Isolation breeds fear. You don’t want to live a life of fear? Stop isolating yourself.